1. We did some adjustments on UI and Setting Menu. 2. Added more recognition languages, including: French, Spanish, German, Italian, Portuguese, Dutch, Danish, Swedish, Finnish and Turkish. 3. Added Notification Center, you will be hearing from us soon. 4. Now you can export OCR results to txt file. 6. Fixed some bugs including Android 5.0 compatibility issues. Wanna give it a try? Go to Google Play and search for “Docs Matter” or click on the link below! If you think that a feature is missing in our product don’t hesitate to mention it in the comments. We can evaluate the suggestion and add it in a next version. New Android Application – Docs Matter helps you capture and manage your paper documents on the go. 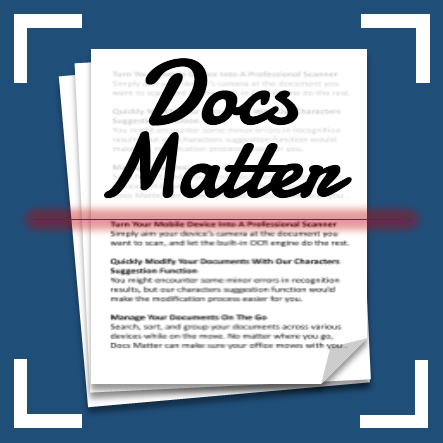 Docs Matter’s main feature is to scan the document you have, and use the built-in OCR engine to retrieve text from document. You are able to find any document you need by entering few keywords, even more, you can export it to searchable PDF and share it with your co-workers or friends. Yunmai Technology – December 19th, 2014 – Docs Matter is a new intuitive application which provides you a better way to manage your documents on the go, and never need to worry about missing files any more. The reason that makes Docs Matter better than common document management application is that Docs Matter has an OCR engine within. The OCR (Optical Character Recognition) technology allows you to retrieve the text from your document. Docs Matter can recognize documents in 14 different languages (European Languages + Chinese Traditional/Simplified) with a high accuracy rate. In order to reduce the time to review the OCR results, we added a new function: Character Suggestion. Whenever a character has been recognized with a low accuracy rate, Docs Matter will recommend a list of 5 characters for you to replace inside the document. Export to searchable PDF: export your document to double layer PDF, the recognition result are included within the picture of your document, so that you keep the original document layout and also include the text that have been recognized. Share your documents by Email, social networks, or upload them to your Cloud Storage. In the meantime, you can also keep them synchronized with our cloud, so you don’t have to worry about losing your documents. You can find Docs Matter on Google Play for your Android devices. Yunmai Technology Co., Ltd. was founded in 2002. Our line of products includes Document Recognition, Business Card Recognition, ID & Driving licenses Recognition, Bank Card Recognition. We also have developed our own Instant Messenger technology. Our products are available on a large variety of platforms including PC, iOS and Android. We have released an updated version of our Documents Management Application on Google Play. Docs Matter let you scan your paper documents and with the built-in OCR (Optical Character Recognition) engine, retrieve the text from within the picture. You can then organize and search for any documents by entering a few keywords. The application auto-crop and enhance the picture so that you have clean documents. Then export them into double layer searchable PDF file. Share your documents with your coworkers or friends. Always have all your important documents on the go with you! Scan Documents, Modify Contents, Share Results. One of Yunmai Technology’s professional optical character recognition (OCR) document scanning applications. Its main feature is to scan the document you have, and use the built-in OCR engine to retrieve text from document after scanning. You can modify and save recognition results after the OCR engine finished its work.